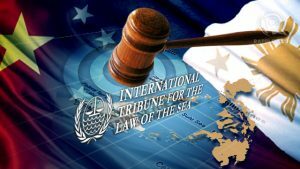 Ghana breathed a huge sigh of relief when new geographic coordinates set out by The International Tribunal for the Law of the Sea (ITLOS) in its ruling was plotted to set the single maritime boundary between Ghana and Côte d‘Ivoire and Ghana did not lose any portion of the Tweneboa-Enyenra-Ntomme (TEN) oil fields to Côte d‘Ivoire. The new geographic coordinates were plotted because the Court discovered that the geographic coordinates used by both Ghana and Côte d‘Ivoire were inaccurate. The Tribunal decided not to use either of the base points advanced by the two parties as the starting point on land for drawing the line into the sea. It, therefore, settled on what it called BP (boundary pillar) 55 as the starting point for doing the delimitation just as Ghana had put forward. Delivering the judgment, Boualem Bouguetaia President of The Special Chamber stated that the Chamber unanimously found that Ghana did not violate the sovereign rights of Côte d‘Ivoire. ITLOS Special Chamber ended the four-year-old maritime dispute between the two West African countries. There were fears that Ghana’s TEN Fields, which hold an estimated two billion barrels of oil, could have been affected by the ruling and Ghana was on tenterhooks when the judgment was being read with most people glued to TV or radio. But in a unanimous decision, the Special Chamber said Côte d‘Ivoire did not provide a resounding argument to back its claim. In the end, most of the arguments put forward by Côte d‘Ivoire rejected by the Special Chamber. Ghana, discovered oil in 2007 prompting Côte d‘Ivoire, which had been pumping oil for decades, to revive a claim to some of its territorial waters. Several rounds of talks failed to result in a deal on the border which, like many other African sea borders, had until now never officially been set. According to the Chamber, Côte d’Ivoire failed to prove lack of good faith on the part of Ghana during negotiations between the two countries. The Special Chamber also rejected Côte d’Ivoire’s claim that Ghana violated the Special Provisional orders issued by the court on April 25, 2015. The Special Chamber accepted Ghana’s argument of adoption of equidistance method of delimitation of maritime boundary between it and Cote d’Ivoire. It, accordingly, rejected Cote d’Ivoire’s bisector line method of delimitation. Cote d’Ivoire’s claim that Ghana and its coastal lines are unstable was also been rejected by the Special Chamber. Ghana’s argument that both countries had a non-treaty based “tacit agreement” regarding a “customary equidistance” boundary failed. The Tribunal agreed that the methodology governing the delimitation of the maritime boundary between Ghana and Cote d’Ivoire is the equidistance method, thus rejecting Cote d’Ivoire angular bisector theory. Using equidistance methodology, the Tribunal decided that it would not use either of the base points advanced by the two parties as the starting point on land for drawing the line into the sea. The tribunal settled on what it called BP (boundary pillar) 55 as the starting point for doing the delimitation just as Ghana put forward. The Tribunal then proceeded to set the geographical coordinates along which through line starting on land from BP 55 into the sea, extending to 200 nautical miles into the sea and beyond. The tribunal rejected all of Cote d’Ivoire’s arguments that certain geography-related special circumstances warranted an adjustment of the resulting equidistance in their favour. It also rejected Ghana’s argument that the existing customary equidistant line be considered as a special circumstance to adjust the new line in Ghana’s favour. The area in dispute between the parties lies at the centre of the Tano Basin, a proven petroleum-rich basin, generally located offshore. Ghana discovered oil in commercial quantities in June 2007 and in 2009. Cote d’Ivoire began suddenly, and without notice to Ghana, to repudiate the common maritime boundary, and took the position that the boundary should be re-demarcated. It even proceeded to write to oil companies operating in the disputed area to stop all activities. After 10 failed negotiation attempts, Ghana, in September 2014, announced through then Attorney-General and Minister of Justice, Mrs Marietta Brew Appiah-Opong, that it had instituted arbitration proceedings at ITLOS to ensure the resolution of its maritime boundary dispute with Cote d’Ivoire. The first round of preliminary hearing of the case began in March 2015, when Cote d’Ivoire prayed the tribunal to stop all activities in the disputed area, but Ghana led evidence to prove why activities in the disputed area could not be halted. The tribunal, on April 25, 2015, refused to stop oil companies operating in the disputed area to stop operation but it stopped the drilling of new wells until the final determination of the case. Due to the change in government, Mrs Appiah-Opong on February 6, 2017, officially handed over the baton to the current Attorney-General and Minister of Justice, Ms Gloria Afua Akuffo, at the Special Chamber of ITLOS in Hamburg, Germany. Ms Akuffo led Ghana’s team to show cause why the existing maritime boundary must be maintained, while the Ivorian team was led by a former Minister of Petroleum in Cote d’Ivoire, Mr Adama Toungara. Ms Akuffo, on Monday, February 13, 2017, officially ended Ghana’s oral arguments and asked the tribunal “to reject Cote d’Ivoire’s attempts to argue that an oil field built up and developed over decades should have been abandoned overnight in 2009 when Cote d’Ivoire decided that a different boundary would suit it better. The cynicism here is all that of Cote d’Ivoire, I am afraid to say, not of Ghana”. She prayed the Special Chamber to apply well-established legal principles to a clear and consistent body of evidence. Ghana, accordingly, prayed the Special Chamber to declare that Ghana and Cote d’Ivoire mutually recognised, agreed and applied an equidistance-based maritime boundary in the territorial sea, EEZ and continental shelf within 200 miles. Ghana again pleaded with the Chamber to hold that the maritime boundary in the continental shelf beyond 200 miles follows an extended equidistance boundary along the same azimuth as the boundary within 200 miles to be the limit of the national jurisdiction. Further to that, Ghana wanted the Special Chamber to hold that Cote d’Ivoire was, in accordance with international law, being stopped from objecting to the agreed maritime boundary. Another order sought by Ghana is a declaration that “the land boundary terminus and starting point for the agreed maritime boundary is at Boundary Pillar 55”. Making a case for Cote d’Ivoire, Mr Toungara told the tribunal to reject Ghana’s requests and claims and rather declare and adjudge that the sole maritime boundary between Ghana and Cote d’Ivoire follows 168.7 degrees azimuth line, which starts at BP 55 and extends to the outer limit of the Ivorian continental shelf. Cote d’Ivoire has also urged the tribunal to hold that Ghana’s unilateral activities in the Ivorian maritime area constitute a violation of the exclusive rights of Cote d’Ivoire over its continental shelf, as well as its obligation to negotiate in good faith. Cote d’Ivoire also wanted the tribunal to hold that Ghana violated the tribunal’s April 25, 2015 provisional measures.